Traditionally, dealerships are setup to reward individual performance, rather than rewarding the efforts of a team. 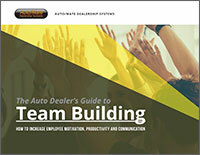 This eBook was created to help you fully understand the value of stronger teams, how to assemble your team and structure your dealership to get the most benefit from teams. Download our FREE eBook today to jumpstart your thinking on team design, team goals and things to try.